If you had told the likes of George Orwell and Aldous Huxley about the technology advances in the future, they wouldn’t have believed you. Not only is technology leaps and bounds past the likes of ‘Big Brother’ and ‘soma’, but we are actually printing things that used to take significant time, factories, resources, and human assistance to build. How is this possible? 3D printing is taking the world by storm and it shows no signs of slowing down. In 2015, Chinese company WinSun, printed not one, but two buildings. It gets better, they did this by using industrial waste which they transformed into new building material. To accomplish this feat, WinSun used a CAD design controlling an extruder arm which laid down the material. The walls were hollow and given a zig-zagging pattern which provided some reinforcement. This process saved between 30-60% of construction waste, reduced production times by 50-70%, and cut labor costs by up to 80%. Sure, there is a lot of artificial food on the market currently, but printed food? When powdered proteins, carbs, and sugars were printed together, they created an edible “Meal Cube”, which was created completely via a 3D printer. The idea behind “Meal Cubes” is to create a more sustainable food system by having efficient and economic ways to produce food. Four years ago, using only free online 3D printers, a Colorado high school student created a fully functioning prosthetic arm and hand. 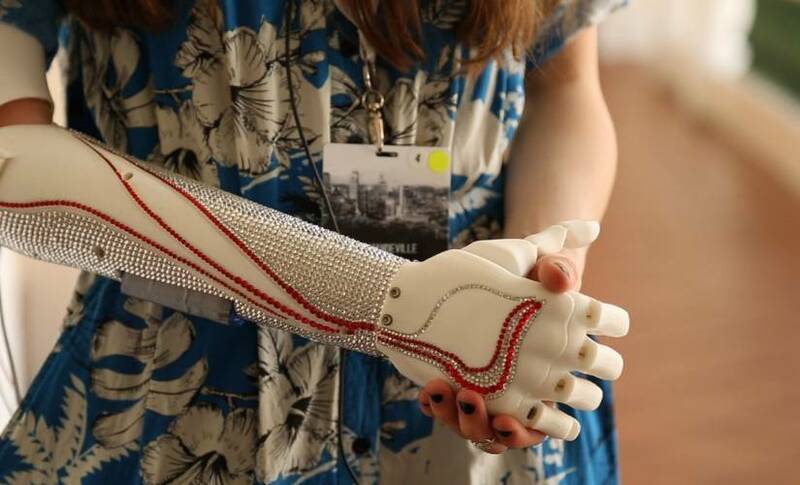 Since then, prosthetics have come quite a way, becoming fully available with custom-fitting parts and nearly full functionality. In fact, a printed prosthetic jaw bone was constructed from titanium powder creating a bone-like material. The patient who received the prosthetic was able to speak normally just a few minutes after his surgery. In addition to the above, a working gun, medical models and facial prosthesis are among other marvels that have been printed in recent years. Almost everything that can be printed in 3D can also be personalized. Doctors and medical experts are already using 3D printing to create bone replacements fully customized for each patient. Experts of the industry are already experimenting with 3D printing using Graphene, a flexible and transparent substance, stronger than steel. Markforged, a Boston-based company, has just released new Composite 3D printing technology which prints tools and manufacturing parts with incredible strength. Fully functioning metal parts can be printed in under 24 hours with their new Metal X 3D printing system. The tool promises to save money and time especially for the manufacturing industry. Nano-printing involves the printing of particles invisible to the naked eye. These particles, which are only a few atoms thick, could possibly transform electronics as we know them. These tiny printed particles are currently being tested to produce powerful batteries, and provide further processing power for devices. Additionally, nano-printing is currently being used to increase the optic power of the world’s telescopes and microscopes. According to Nanowerk.com, “these nanosensors can enhance the microscopes’ sensitivity and detection speed by miniaturizing their detection component up to 100 times”. In Belgium, students are in the process of creating a robotic arm which will be able to interpret and translate sign language. The birth of the idea came to be as a result of the small number of sign language translators available in the world. Thus far, the machine can take text and translate it into finger spelling. The project still has a long way to go, but could significantly impact the hearing-impaired community. Just as you were starting to wrap your head around 3D printing, 4D printing comes to take it further. So, what is it? 4D printing is generally considered a part of 3D printing, however, 4D printed materials will be able to adapt to their environments and transform after they have been constructed. This programmable matter can react to outside factors like environment, head, humidity, etc. Technology continues to amaze us in the arena of 3D printing. 2018 will prove to be another mind-blowing year. So, buckle up and get ready to be wow-ed.